This post incorporates 5 handy tips that I’ve implemented myself and found to work for me that helped my blog to grow. 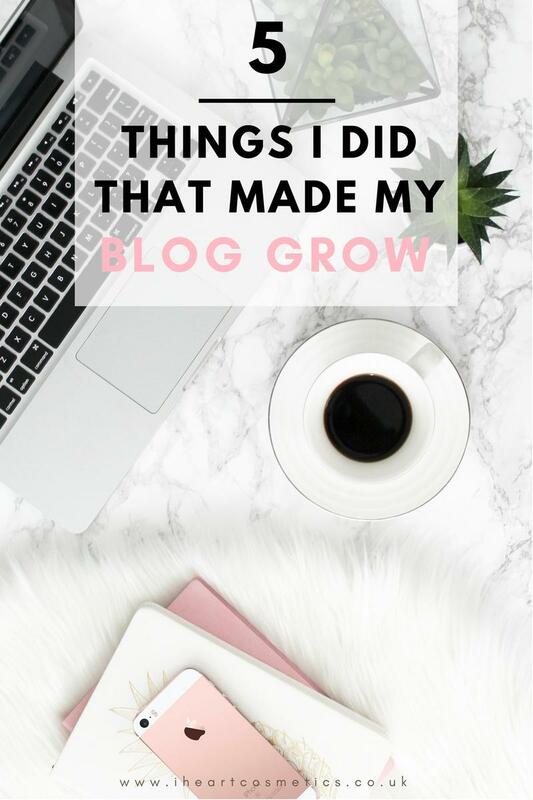 They should work whether you’ve been blogging for a while and are feeling in a rut, your growth has plateaued or you are struggling as a new blogger. One of the secrets to growing your blog following is consistently posting content that your readers value. Sounds simple, doesn’t it? But often the simplest sounding things are the hardest in practice. You may have a blog but you probably also have a busy life and a full-time job to deal with as well. Never fear, we’ve all been there! I’ve been writing Iheartcosmetics since 2009. 8 whole years! Despite blogging for all of that time with no break (unless I was on holiday), I never set myself a schedule and just wrote a post here and there whenever I felt inspired. Recently I set myself a task of scheduling at least 2 new blog posts a week. Then promoting each on twitter and Pinterest and also posting one Instagram photo per day. This has increased my readership by 30% in just a few months. Posting often increases your visibility on social media as it gives people more content to read and share which in turn, brings more new people to your blog. Starting a blogging schedule is the best way to gain control of your blog posts. It’s a bit like starting an exercise regime. You need to work out how often you can commit to writing posts, balancing how many posts at a time you have time to write on those days. Play around with different schedules until you find one that fits your lifestyle so you don’t feel overwhelmed juggling your blog and your life. Scheduling weekly batch days totally changed my life. And I’m really not exaggerating. All it means is that you dedicate a specific day to one task and one task only. One day a week you focus entirely on just writing blog posts, another day of the week you focus entirely on taking and editing your photographs, you may also want to take another day to work on SEO, post scheduling, email replies or general admin if you have more time. However, I only have 2 free days per week to blog. I write my posts before taking the photos so I can ensure I can note down specific photos I need to take to go along with each blog post. You might prefer doing it the other way round if you love taking photos, as that might inspire your writing. Whatever works for you! I recommend taking all your blog photos, extras for Instagram and then doing swatches last, as if you’re like me you will up in a mess and need a rest after doing them! Write a list of all the posts you need to write and any other ideas for posts you can think of. Write a separate list of all of the photos you need to take to go with each blog post and some ideas of photos to take for Instagram. Going forward, try and keep this list with you or on your phone so you can add ideas whenever you think of them. On day one, work through your blog posts one after the other. Simply type it up, spell and sense check, save it and then move on to the next post. The second day, get all of your products, photography equipment, and props out. Set yourself up a mini studio and go through all of the photos you need to take for each blog post and take extras for Instagram. Play around with different things and layouts to see what you can improve upon. Then edit all of the photos. Add your photos into your posts, schedule them to which days and times you choose and that’s sorted. Depending on how often you’ve decided to post per week you could get up to two weeks blog posts written and completed in just those two days. I then recommend using buffer/hootsuite which are scheduling software systems for automatic tweets and Instagram posts, and scheduling those for the forthcoming week. It is incredibly hard to build a social media following and increase your numbers. From spammers ruining your comments to bots who follow and promptly unfollow it can be very tedious and time-consuming. And there are so many social media channels. My suggestion is that you pick one or two and really focus your efforts on there as it will take some hard work. I suggest Instagram first and secondly Pinterest. One of the most effective ways you can gain Instagram followers is to focus on your niche topics and network with other people. To do this, browse through the different hashtags of things you are interested in, it doesn’t have to be just the topic you write about on your blog all the time. Firstly, start with topics you blog about and always check out the #bbloggers and #lbloggers hashtags. Like people’s photos, and leave a proper comment actually relating to someone’s post (leave single emoji’s for people you are already friends with and like all of their posts) and really try and engage and make a connection. Always give a comment back to someone that comments on one of your Instagram posts too, to show them you are grateful that they took the time out of their day to comment. Ensure you are hashtagging your own posts so people can find them. If you find hashtags annoying simply make a line of emoji’s or use a few returns between your text and the hashtags to make it more pleasing to the eye. Also tag anyone or any brand featured in the photos, as they will get an alert that you have tagged them and maybe they will share or repost it themselves to their wider audience. As they say, Pinning is winning! Stick to your niche and keep any non-blog related boards on private so only you can see them. On Pinterest, I stick to pinning beauty, travel, my own blog posts, TeaPartyBeauty’s beauty blogger group board, a blogging tips board and an Instagram tips board. All of these focus on my blog, blogging or the two topics I write about on my blog. Don’t think that the more diverse boards you have the more followers it will bring in, it will do the opposite. Narrowing the focus of your blog topics helps you build a strong blog, and narrowing the focus of your Pinterest boards will do the same. Think about what your blog is about and create boards that relate to your chosen topics. My next goal is to style my board headers so they look more aesthetically pleasing, I haven’t done it yet so when I do I will write about that for those who want to have a better-looking profile theme. If you’ve been blogging for quite a while there’s a good chance that you have learned a lot of new things in that time. You’re probably better at writing, better at taking photos and more on the ball with SEO. You may not have known how to make your images Pinterest friendly or you may not have used photos at all! If you still have old posts that generate traffic (check your analytics) then start with those. Edit down the text if there are massive paragraphs. Upgrade old photos to new versions, if you don’t have the products anymore try and re-edit the photos to make them clearer. Also ensure you update the links, especially if you are using affiliate marketing, to ensure you are not linking to sites or pages that no longer exist! You may also have more to say on a product than you did a long time ago. Perhaps you have since repurchased it many times or they have changed the formulation and now you don’t like it. Take a fresh eye to your old posts and upgrade them to be in line with your current standard. This will ensure people read more pages of your blog and stay longer as they are finding all of your content to be of the same, high standard. I had some blog posts that I was, frankly, unimpressed with upon reading them back. They had very low traffic, terrible writing and awful pictures. So I just deleted them! They were doing more harm than good staying live. Give your blog an audit and if there is no way to salvage an old blog post, simply delete it and perhaps re-write it in future if you thought the topic was interesting. Now we all know we should start engaging more with others on their blogs. But sometimes people go about it in such a way it is actually detrimental to their blog and puts people right off. By ‘smart commenting’ I do mean commenting on blogs that you actually read, not by finding people with high followings and spamming their comments section with your link in the hope more people will see it. Read and comment on blog posts that truly interest you. Always include your name, blog URL and the most important part – a thoughtful and useful comment. The guidelines I personally adopt for commenting are being courteous, writing at least one proper sentence and not writing things like ‘please follow back’, or ‘check out my blog’ as these are so annoying. A simple, polite comment could just be congratulating them on a post you found interesting and informative, on their writing or photography skills, that you like something about their blog in general or them or their style. Or you could try and add something meaningful to the conversation that they might have forgotten or not know such as ‘hey did you know that they have this product on sale with 50% off in x shop at the moment’. As you can see that is a helpful comment. Writing “Nice post, I agree” is not adding to the conversation. Hopefully, they and other commenters will check out your blog when they see a comment, as you seem like a nice, polite, interested person with something useful to say. Which will increase your readership of the type of people you want to drive to your blog. So these are the 5 Things I Did That Helped My Blog Grow. I hope you took something useful from this post and found it informative or helpful. Have you tried any of these approaches? What are your thoughts?